Peter Ronalds Tonimbuk Fire Restoration. Ingrid & Robert Green. 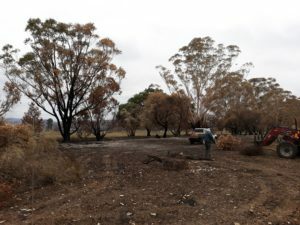 21.3.19 saw Labertouche Landcare bog in and assist with Farm restoration after severe Bunyip Fires affected Ingrid and Robert Greens River Farm at Tonimbuk. 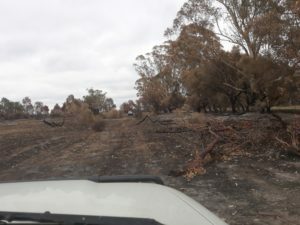 Severe fires tore through Tonimbuk which is a beautiful farming area. Photo from 2.3.19. noted the entire Bunyip Hills to be alight. 20 keen Landcare members from Labertouche met at the Tonimbuk farm and formed into groups. We flattened the burnt wire and transported it to the front of the property for collection. One group removed and rolled wire. Another group chain sawed up fallen trees. Another group pushed up the fallen timber ready for burning over WINTER. Ingrid and Robert Green run a mix of commercial cattle with some of Robert Greens grandfathers original Stud Hereford cows from Queensland. These are superb Hereford cattle, breeding super calves. Very correct. Perfect feet. Some of the best Herefords I have seen. Charolais, Murray Grey, Simmental Fleckvieh, Angus are put to a Hereford bull with the resulting calves being impressive. About 200 head were yarded and being fed hay. As the fencing is replaced and some of the grass returns, the cattle will be back out in the paddocks. The fires went through on 2.3.19 and there were shallow but green shoots coming back into the paddocks. Flattening the burnt wire ready for loading onto the trailers. Back paddock where branches were chainsawed.